For fairly obvious reasons, bullying has been heavy on my mind these days. The recent suicides of several GLBTQ teens have brought the issue back to the fore in a way similar to that of the media blitzes that followed school shootings like the ones in Jonesboro and Columbine – and while both parents and pundits discuss the horrible reality of bullying at schools around the country, we have also been witness to an entire political campaign season full of bullying: bully signs, bully pulpits, bully commercials and rhetoric… All of these things point to an uncomfortable truth: in all sectors of our current system/culture, bullies thrive and rise to the top. Most bullies don’t suffer from low self-esteem. Some have circles of friends and may have a high status among their peers. Most bullies are not looking for attention, so ignoring the bullying is not a way to make it stop. Bullies look for control. The behavior is likely to escalate if adults ignore it. Bullying behavior isn’t something a child or young person outgrows. Research shows bullies are at much higher risk of later becoming involved in a crime, alcohol or drug abuse, or tobacco use. Victims of bullies are rarely able to stand up to bullies and deal with the situation themselves. They are usually younger or physically weaker than their tormentors. In order to withstand bullying, children need a system of supportive friendships, something victims often lack the social skills to form. 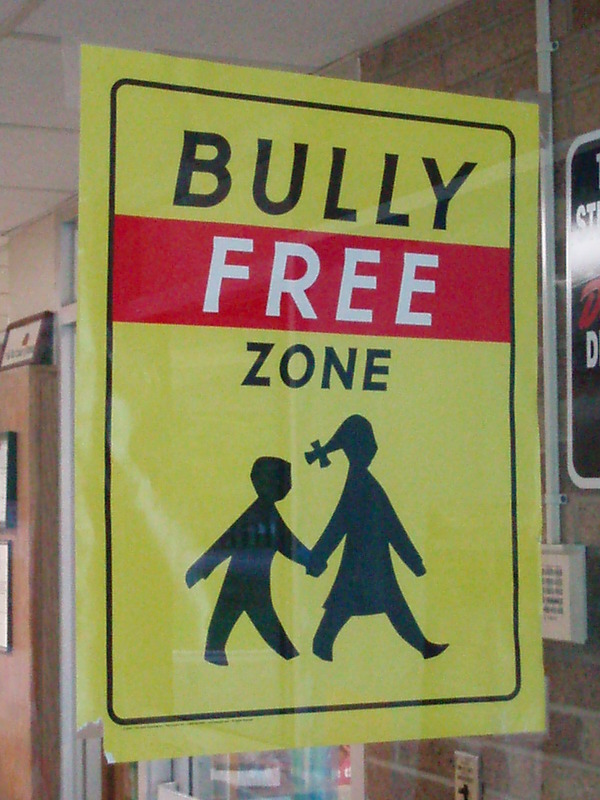 Contrary to what many parents believe, most bullying does not occur off school grounds. Almost all bullying occurs at school. Bullying is not an isolated instance but rather a fact of life in a majority of schools. Most bullying takes place outside the sight of teachers. Many of those targeted are reluctant to report their harassment because they are afraid of retaliation, and most bullies deny the behavior if confronted. Many victims of bullying suffer lifelong side effects, including depression and mental health problems. Some suicides are attributed to bullying. While this list is clearly directed towards the bullying that occurs in educational settings, there are striking parallels between these schoolyard exchanges and the discourse taking place in political campaigns, social networking sites and even (*gasp*) the church. For example, how many of the politicians you’ve seen really need more attention? They’ve got friends, family, fortune (more often than not) and fame (at least in their own particular context). What they are looking for is power. Now, power in and of itself is not a negative thing – there are politicians out there who truly want to serve the greater good by using the power they have been given by the electorate. But, regardless of the intentions of each individual politician, this campaign season has demonstrated how a desire for power and control can lead one to pick up the tools of a bully: belittling remarks, cruel (and often racist, sexist or homophobic) jokes at another’s expense, statements that call into question not just an opponent’s positions and beliefs, but also their character, their citizenship, their patriotism, their faith, their very humanity. Similarly, our churches all house individuals who crave control and use the bully tool belt to get what they want: poisonous remarks lobbed with a smile like velvet-covered bricks, statements that call into question a church member’s status as a Christian, insinuations that straying from the “right way” will get you left out or ejected from the fold. Both our political discourse and our ways of disagreeing with one another have devolved into bullying. What makes it different from the bullying of a schoolyard is that it takes place very publicly. While there may only be a handful of silent bystanders in the hallway of the middle school, we are all bystanders as politicians attack one another, the supporters of their opponents, and the pundits – and we are all bystanders as church members or co-workers or family members rough people up (verbally, emotionally or physically) in order to get their way. Unfortunately, silent bystanders are just as much a part of the problem as the bullies themselves. Researchers all agree that bullying is a learned behavior. It is something we are taught (both by bullies and bystanders) and it is a behavior that doesn’t go away easily (see #3 above). In some ways, bullying becomes an addiction – once you pop, you just can’t stop. And while we have spoken out of one side of our mouths to bemoan the dire situation of those children and teens who fall prey to young bullies, we’ve used the other side of our mouths to participate in “adult” systems where bullying is the norm. Children and teens learn how to be adults by watching us. If we want bullying to not be normative in our schools, we’ve got to step up and quit modeling it for the young people in our circles of influence. Regardless of whether it happens at school, at work, at our place of worship, at home or during a debate, bullying is wrong and it is well past time for it to stop. Let this change begin with us.